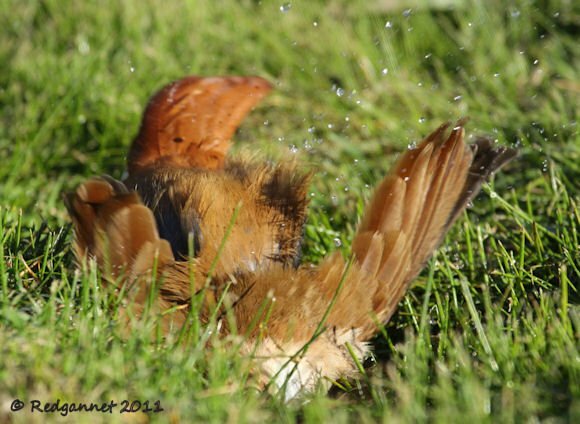 Rufous Hornero, Furnarius rufus is an ovenbird from South America. 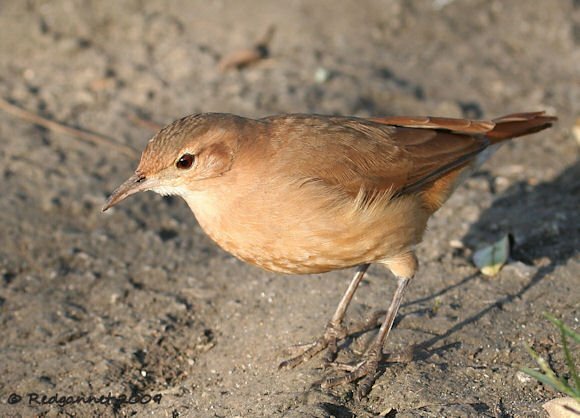 It is one of the most common birds seen in the parks and even on the pavements of the cities. With its exaggerated gait it is easily recognisable from a distance and its bright rufous tail makes it an easy bird to identify even if it is flying away from you. The trick is to know what it is before hand as the field guides do not give it star billing in their illustrations. Perhaps the authors of South American field guides assume that such a common and easily recognised bird does not need to be given prominence and page space, but I feel there is justification to push abundant birds forward and recognise their status. It does not leap out at you from the page in any of the region’s books and the first time that I saw one, it took a ridiculous amount of time to identify it from scratch. It is a good looking bird however and worth a gallery. Even better, the 10,000 Clicks page doesn’t have a Furnariidae section yet, which will keep Mike and Corey from setting any more homework until they make one. Furnariids build oven nests. 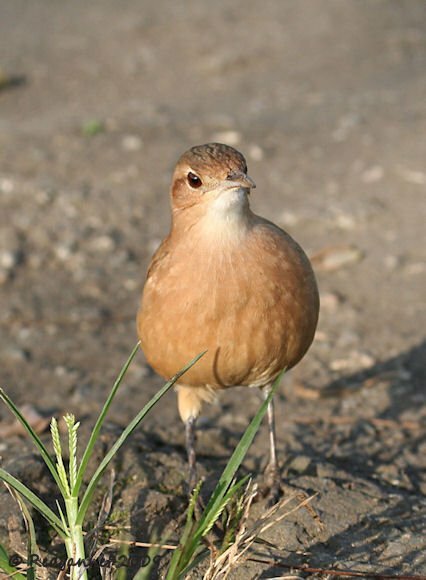 The Rufous Hornero uses wet mud to build its furnace supported by the horizontal branch of a tree, often incorporating a vertical shoot for extra security. It resembles a thick-walled mud cup, tipped through 90° with a mud screen at the front allowing access round the side. Both birds work on the nest and share incubating duties. They indulge in relationship-strengthening displays as they build, which may take 2-3 months. A pair may stay together for many years if they manage to successfully raise young together, but they will commonly build a new nest for each season. 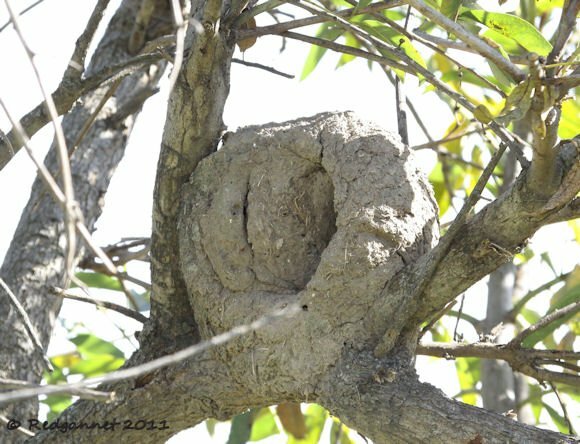 The nests are solidly built and last many years, providing nesting sites for other species. The prevailing weather direction is often taken into account when positioning the entrance. Man made structures such as stout fences or road signs may be used as nesting sites, but they need to be sturdy as the nest might weigh up to 5kgs. 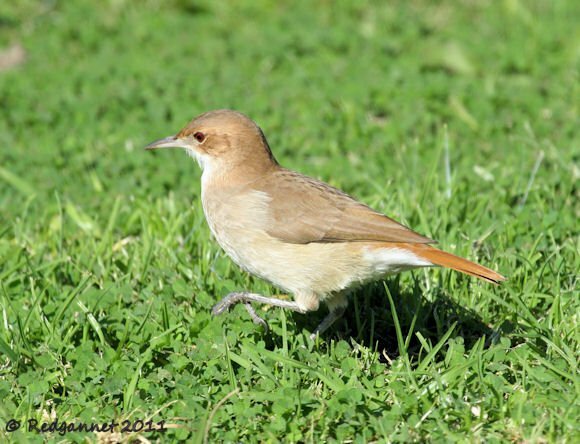 The Rufous Hornero is not an avid flier it prefers to walk where the option is available. Its distinctive gait makes it instantly recognisable, even from a distance. It is a high stepping strut with a reciprocal thrust forward of the head at each step. Inelegantly, it could be described as an exaggerated chicken impression. Four subspecies exist. The first two pictures were taken in Sao Paulo, Brazil, and match the geographic distribution of F.r. albogularis. The rest were taken in Buenos Aires, Argentina which likely makes them F.r. paraguayae. A third form, the nominate could also occur at both of these locations, hence my fence-sitting. The differences are comparative. For example, F.r. albogularis is slightly smaller than the nominate, but without one to compare to the other, I am not keen to commit. Love the shots and the information. Also, for the record, we do have a Furnariidae section but you just doubled its size (before this we had my post on Pacific / Pale-legged Hornero). A whole page on this species and no mention of its status as the National Bird of Argentina? This species had to beat a lot of awesome birds to claim that role. ’tis true. 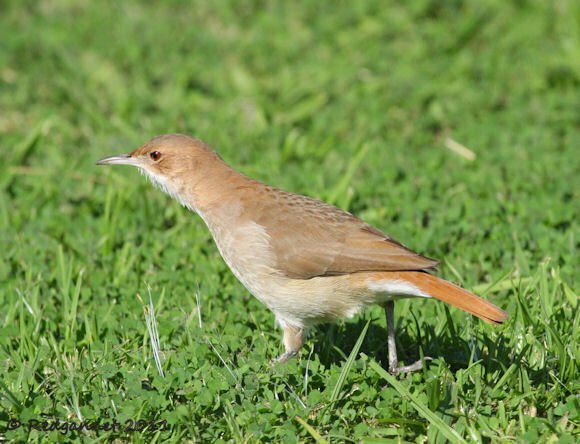 The national bird of Argentina is indeed the Rufous Hornero. 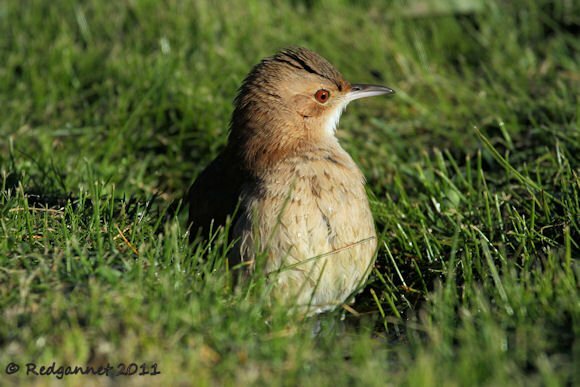 Although it might be tempting to adopt one of the spectacular species to flaunt your avifauna (and there are plenty to choose from), the Hornero would be recogniseable to most of the people of the country that it is representing. It can also be relied on to show up when some of the more gorgeous, needy, flighty birds would be less professional. Redgannet – thanks for this post on the Rufous Hornero. On my first trip to South America it also took me a ridiculous amount of time to figure this bird out via the guides for the region. This was a memorable species especially due to those interesting nest contructions. I saw some lovely ones on light poles in Bolivia. When is a Pacific Hornero not a Pale-legged Hornero?